Proof coil chain is one of the most common, economical and versatile chains for all kinds of non-lifting applications. We stock many sizes and finishes of proof coil chains. Self colored proof coil chain, hot galvanized proof coil chain and electro galvanized proof coil chain. All available in full drums or custom cut sizes. Other chains available include high test chain grade 43 chain, grade 70 transport tow & binder chain and alloy chain grade 80. For more information about our proof coil chain or any of our other chain products, contact us today. Proof coil chain grade 28 is used for light duty applications such as fencing, railings, and more. NOT for lifting. High test chain grade 43 is used for light duty applications and binding stationary objects down. NOT for lifting. Transport chain grade 70 is used for binding objects down that are being transported on trucks, rail cars, ships, etc. D.O.T. approved and marked. NOT for lifting. Alloy chain grade 80 is used to make lifting slings and assemblies. 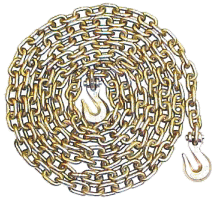 Transport tow and binder chain is used for binding objects down that are being transported on trucks, rail cars, ships, etc. D.O.T. approved and marked. NOT for lifting. Lever type load binders are used for securing loads using chain (usually grade 70 chain). Ratchet type load binders are used for securing loads using chain (usually grade 70 chain).